Finally the wedding day! Let me just start by saying that the wedding day went perfectly -- a perfect sunny day, beautiful bride and groom, good company, and of course, the wedding cake turned out well. The night before the wedding day, I ended up staying up too late to prep the cakes and doing laundry and packing that I did not have time to update the blog. I was leaving to Korea right after the wedding ceremony for a family emergency so I was completely flustered trying to multi-task. On top of the packing and getting ready to leave to Korea, I had to borrow a large car from work to transport the cake safely to the venue, assemble/ice the cakes, pack up all of the materials I need onsite during the cake assembly. I had made a giant mess of buttercream spattered everywhere on the floor as I was trying to make that perfectly smooth surface so it took a long time to clean up. My back was aching as I was tilted sideways with a spatula on one side of the cake using the turntable to smooth out the frosting for over an hour. And I was nervous as hell praying that everything would go as planned. The day of the wedding, I woke up around 6:30 am and loaded up the car with the help of my trusty assistant Penny. The biggest fear for me was transporting the cakes to the reception site. I was afraid the bumps and curves of the road would topple the cakes over or smash them right into the wall leaving me with unusable cakes and no back-up plan. But because the cakes were refrigerated pretty solid overnight, the cakes felt perfectly safe and secure in the back. And we got to the site safely around 7:30am. When we arrived at The Village Pub, the staff was already busy arranging the tables, polishing stemware and cleaning up the space. Penny and I unloaded everything and settled down to start the assembly process. The halogen lamps directly above the table where the cake was to be setup was giving off a fare amount of heat so we dimmed the light and worked in the darkness to prevent the frosting from melting too much. A Multi-tiered cake requires a good solid structure in each of the tiers to be able to prevent the tiers from collapsing down. The cake itself is not strong enough to support all the weight above so dowels need to be inserted in the tiers. So dowels cut to the right length are inserted into the bottom tier, then the next cake tier with a cardboard round on the bottom gets placed above the dowel supports. The stacking process went very smoothly. Some patch work needed to be done here and there to cover up the gaps and imperfections. And finally for the finishing touches, I did a little decorative bead work with the buttercream around the seams where the tiers met to hide the sides of the cardboard rounds visible from the outside. When the florist arrived, beautiful purple orchids and roses were artfully inserted into the cake. 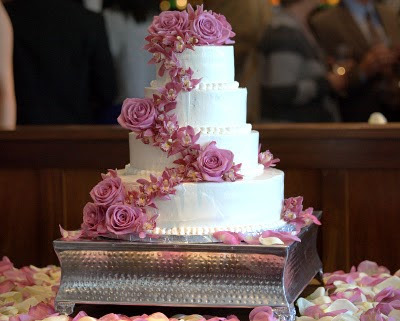 As the cake sat fully assembled with stunning flowers (and purple is my favorite color too) under a spotlight in the reception hall, a giant sense of relief and happiness came gushing in and I no longer had to worry about ruining Lisa's happy wedding day! The ceremony was at Memorial Church at Stanford University. I never thought I would cry seeing a bride walk down an aisle, but I did seeing Lisa in her beautiful white dress walking down gracefully with a smile on her face. Needless to say, it was a perfect wedding. Unfortunately, I had to leave abruptly to catch my flight right before the cake cutting, but I was so grateful to see the cake being appreciated by everyone and to hear later on that people enjoyed eating it as well. This is by far my biggest project to date and successful! I'm so happy that I got to take part in my dear friend Lisa's wedding. Congratulations Lisa and Sihong! I baked up an absolute crazy storm tonight. I started baking right when I got home from work and I'm finally done. So it comes out to be about 4 hours - not too shabby considering how many cakes I produced. I made two of 6 inch, 8 inch, 10 inch and 14 inch cakes. Because I only had one of the 10 inch and the 14 inch cake pan, and only one pan can fit in the oven at a time, I whipped up the cake batter 6 separate times! It's a simple classic yellow cake that's buttery and rich but delicate in its texture. I am very excited about how well it will complement the silky vanilla buttercream and fresh strawberries with a bit of a crunch from the meringue layer. I was planning on baking only a portion of the cakes tonight but somehow I got in the zone and just churned all of them out. Now that I only have the assembly left to do (transporting the cake to the venue is a whole another beast I need to deal with later), I feel a lot less pressure for tomorrow. I got a really good tip from this cake book about using bake-even strips around the cake pan while baking for an evenly shaped cake. And today, I learned first hand that they really do work. They keep the edges of the cake from cooking faster than the center of the cake resulting in a more level cake especially for larger cakes. If you've baked cakes that had a funny bump in the middle with deep cracks, these are what you need. Crossing my fingers that everything will go as planned for Lisa's perfect wedding day! Today, I procured all of the materials for the cake. Some rubber pads to put on the car trunk floor to make sure the cake boxes don't shift around on the way to the reception venue, a bubble level thingy to make sure my cake comes out level, wooden dowels that will be used to support the cake tiers, and cake cardboard circles. I also started baking. The strawberry meringue cake I am making for the wedding has meringue disc layers that go between the 2nd and the 3rd layer of the cake in each tier to add some nice crunchy texture. These meringue discs are simply whipped up egg whites with a bit sugar baked at a low temperature for about 2 hours until they are crispy. Tomorrow the real cake baking begins. I think I may possibly need to whip up the cake batter about eight times. We shall see! According to the wedding cake book I am using as a reference, I will need about 40 cups of buttercream. This is to fill and frost a 4-tier cake (14 inch, 10 inch, 8 inch and 6 inch) with each tier being a 4-layer cake. This insane amount of buttercream equates to making about 6 batches of buttercream because each batch churns out 7 cups limited by the size of the mixing bowl. One of the nightmarish things that can happen on the day of the cake assembly is running out of buttercream so I decided to build up some buffer and make 7 batches instead. That's a whopping 49 cups! And this means 56 egg whites and 56 wasted egg yolks. I wish there was something useful I can do with the yolks. Maybe make a bucket of homemade mayo? I will not disclose the exact amount here but let me just say 7 batches of buttercream equals many sticks of butter. The steps to making the italian meringue buttercream is quite simple but it takes awhile because of the cooling time required. Basically, a hot molten sugar syrup is slowly mixed into a batch of whipped up egg white meringue and before you can add any butter, the meringue sugar mixture needs to be cooled completely in a mixer on high speed. This process can take up to 25 minutes. So making 7 batches of buttercream was definitely not quick. Voila. Seven batches of silky vanilla buttercream done! Well, the good news is, now I have the recipe for vanilla italian meringue buttercream permanently etched into my brain and I can separate eggs like a freaking machine. My dear friend Lisa and her fiance Sihong are finally getting married this coming Saturday! I cannot believe it's coming close to 8 years since Lisa and I first met each other at our freshmen dorm. It makes me feel very very old. We share many many memories including going squirrel fishing in the main quad with a stick and a string with a peanut tied to the end of it. 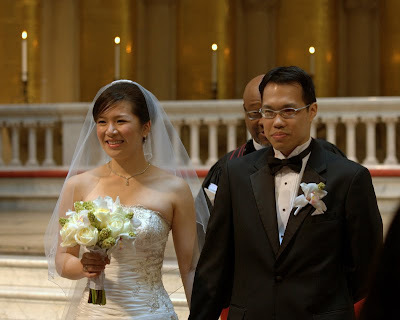 Last year Lisa and Sihong asked me to do the honor of creating their wedding cake. 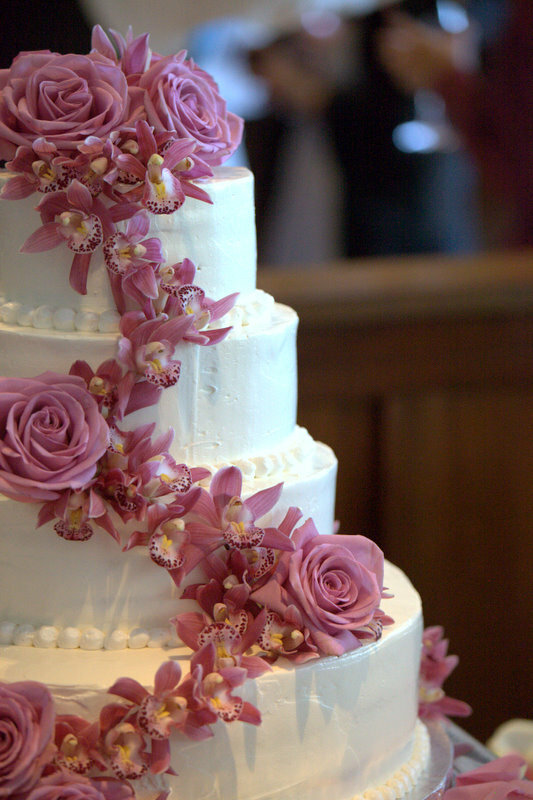 At first, I had to turn it down because I felt like my technical skills as a baker were just too far premature to take over such a big project and I also did not want to be the one to potentially ruin their wedding! But after some more convincing by Lisa and doing some researches on how to make wedding cakes, I decided to take on the challenge. I still get mad chills thinking of the different scenarios where things can go wrong on the wedding day, but I've been preparing slowly for the big day -- lots of reading, shopping for the right tools, detailed planning and testing. Two weeks ago, I hosted a cake tasting for the couple. I had given them a list of about ten different cake flavors and from the list, they picked two to taste. One with yellow cake, strawberries, crispy meringue layers paired with vanilla buttercream and the other with chocolate cake, crispy mocha bits paired with caramel buttercream. A pleasant surprise came along as I was preparing the caramel buttercream with the help of my trusty friend Penny. I was a bit flustered trying to make the many different components of the two types of cakes and managed to put in too much sugar while making the caramel to whip into the buttercream. And of course with the wrong sugar to water ratio, the caramel became too thick, almost to the consistency of candies as it cooled down making it totally unusable for the buttercream. Instead of being bummed about the failed attempt at making the buttercream, Penny and I got excited about this opportunity to make caramel candies. 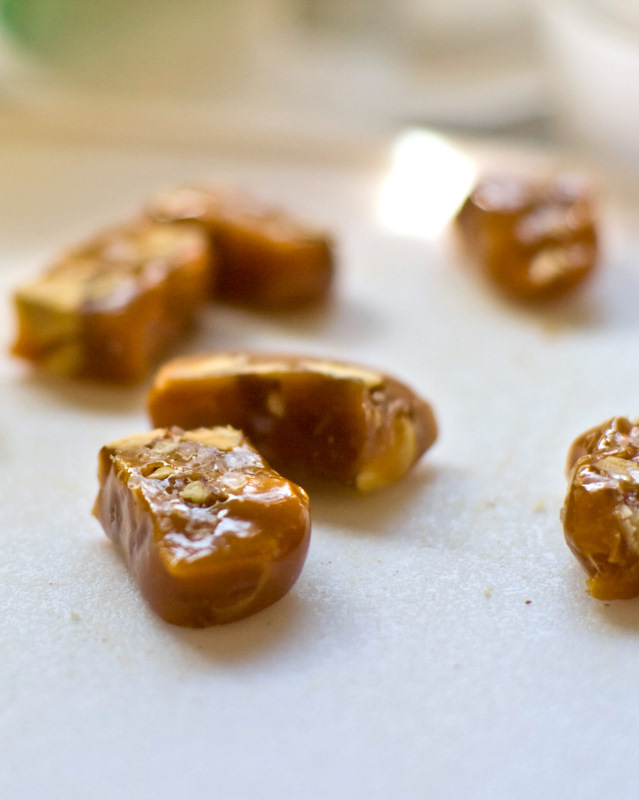 I rummaged through the pantry and found some roasted almonds and sea salt and quickly mixed them into the thickened caramel. The result was an absolute deliciousness. Now I know how to make salted caramel candies! Anyways, back to the cakes. This first cake was a strawberry vanilla meringue cake consisting of 4 layers of classic yellow butter cake. The cake layers were generously brushed with simple syrup infused with vanilla beans to keep the cake moist and add an extra layer of flavor. Between the bottom two layers is light and fragrant vanilla buttercream with slices of fresh strawberries. Then, a layer of crispy meringue disc together with some more buttercream was placed in between the second and third layers for the extra contrast in texture. Finally, some more vanilla buttercream and fresh strawberries between the third and the top layer of cake and finished with some more of the same frosting. The second cake was a rich dark chocolate cake with crunchy mocha bits and caramel buttercream. This cake also consists of 4 layers with nutty but subtle caramel buttercream and crunchy bits of mocha candies sprinkled on top between the layers. Because we wanted the cake to be white on the outside, I covered it with a homemade marshmallow fondant layer which gave it the perfectly smooth silky texture. After tasting, we decided on the vanilla strawberry meringue cake which had the fresh, light and summery taste that we all liked. Just look at how happy the soon-to-be married couple looks! I'll be posting my wedding cake progress leading up to the wedding day so tune in and wish me lots and lots of luck everybody! I just recently got a new baking book called Rose's Heavenly Cakes by Rose Levy Beranbaum. She's the one who wrote The Cake Bible which has become this legendary must-have textbook for avid bakers like myself. However, I've never owned a copy of The Cake Bible because I found the old style layout to be quite confusing and hard to use (it was first written in 1988), but this book I absolutely love. Beautiful photos, great recipes, and detailed instructions and tips. I highly recommend it! Anyways, my friend Lisa has asked me to bake a cake for her boyfriend's 24th birthday and specially requested for a Reese's Peanut Butter Cup cake. And this time around, I decided to use a chocolate chiffon cake recipe from my new baking book. My love for chiffon cake still continues and the result was lighter, more delicate textured cake with finer crumbs and richer chocolate flavor than the chocolate butter cake recipe I had used previously. This three layer chocolate cake has peanut butter frosting between them with bite-size pieces of Reese's peanut butter cup. It was then topped with velvety dark chocolate ganache and wrapped with chocolate ladyfingers lightly dusted with cocoa powder. And finally, the cake was decorated with more of that delicious peanut butter frosting, Reese's Pieces and of course, mini Reese's Peanut Butter Cups.